I am Linda and love Thrifty! I live in Nebraska with my husband, 3 cats , 2 dogs, 2 parakeets and a fish aquarium. I work as a pricing verifier at a local grocery store. My husband has a tougher job, he dangles off water towers and bridges to sandblast and paint them! I have 2 grown sons from my first marriage and 4 grand children. When it is not winter here in Nebraska I am an avid flower gardener! In winter I read away on many cold nights. Liberty Belle and Freedom Belle...Freedom Belle is 8 to 12 years old. She was adopted, so I am not sure of her age. She is a domestic short hair Tortie. Liberty Belle is 4 years old. 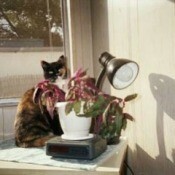 She is also a DSH Tortie. Liberty Belle (DSH Tortie)Liberty Belle (DSH Tortie) Photo. Liberty Belle is 5 years old and is a domestic shorthair tortoise shell calico. I got her as a 3 week old orphan. 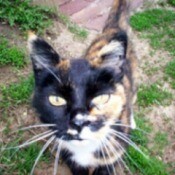 . .
Freedom Belle (Tortoiseshell)Freedom Belle is an 11 year old Tortie. I saw her on the website for my local animal shelter, she was awaiting adoption for 5 months! It was meant to be. A Quick Remodel for the BedroomIt is a snap to do a small remodel to just make a change from what you are tired of looking at. For this fast inexpensive remodel I simply added colored mini blinds and chenille pillows to add color and jazz it up. 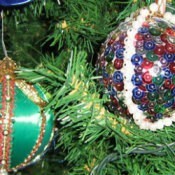 Sequined OrnamentI know there have been similar posts about this, but I am proud of my ornament creations from a satin ball, sequins and pearls, and you can make these for next year still! 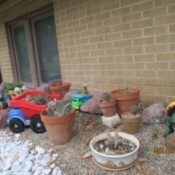 Toys as Cactus PlantersIn the Dollar Store we found some plastic toy wheel barrows and dump trucks. We set them on a mat that keeps weeds out with pea pebbles, and filled them up (first hubby drilled drainage holes) and set them out front.